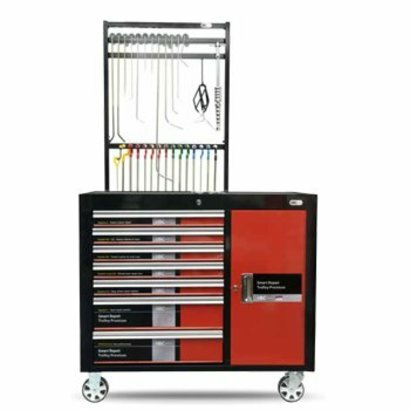 SMART Repair Trolley Premium is excellent for workshops as all the smart repair systems and PDR tools are collected in one place. The Smart Repair Trolley is flexible and is simply a must for workshops that require efficiency, flexibility and mobility. SMART Repair Trolley Solutions comes complete including all hardware, tools and chemicals, which are required for each included system. The fully equipped SMART Repair Trolleys are developed for the high-end SMART Repair specialist. It contains all the necessary systems that are needed to complete a high-end repair of a cigarette burn, damaged leather, scratched bumper, cracked windscreen or damaged rim. Packed in a strong, lockable, 6-tray steel cabinet on wheels which make it very easy to move around in the workshop area. With this state-of-the-art SMART Repair Trolley Solution you always have the right solution.